The Wicker Man is a giant effigy allegedly used by the Druids to perform human sacrifice, according to the writings of Julius Caesar. He mentions it as one method in which the Celts performed rituals, but other than Caesar's observations there is little scholarly corroboration. In recent years, some of Caesar's accounts have been disputed by modern academics. "Wicker” is basically another way of saying ‘basket’. Now, baskets are quite strong, but once you set fire to them, they spring apart, or can be kicked apart. The structural integrity of a figure made out of wicker does not last long when on fire, and as the raw material to space inside ratio is relevant, there’s not a lot of smoke to contend with. Wicker does burn hot mind. Now, imagine a live animal, in a wicker basket which is on fire. Think about the inevitable struggle to escape. Based on experience, there is no way you could burn a live animal to death in a wicker man. They’d get out." "What makes The Wicker Man so important historically in context to Modern Paganism is that much of it simply feels like Modern Paganism. The Wicker Man was the first movie to share rituals that look passably Pagan... The Wicker Man also speaks to the writings of Margaret Murray, James Frazer and other early Twentieth Century scholars who had a lasting impact on what would become Modern Paganism." "The folklore discourse within The Wicker Man coalesces around the film’s reconstruction of an imaginary Celtic Pagan past which has been revived on a remote Scottish island by the fictional laird, Lord Summerisle (Christopher Lee). In this respect, the film attempts to diegetically revive an unselfconsciously Victorian perception of Celtic Paganism. Specifically, the film’s titular set-piece, in which the film’s protagonist Sergeant Neil Howie (Edward Woodward) is burned alive at the film’s conclusion in a sacrifice to the goddess Nuada to ensure the island’s agrarian prosperity, is based largely on the description of this rite in Sir James George Frazer’s The Golden Bough (1890). But it is this interpretation of Frazer, of seeing The Golden Bough as an historical rather than a folkloristic description, which colours the entire film’s folkloristic discourse." In today's neopagan practices, a Wicker Man may be used for celebration of a fire feast or at harvest time (although nowadays it's without the human sacrifice). There are some practitioners who create a figure out of the detritus of the gardens or fields, and then burn it during their autumn celebrations, such as around Mabon. This is sometimes called a straw man; you can make one yourself easily. In some traditions, this figure represents the King of the Harvest. In others, he is made in the fall but not burned until spring, around Beltane, when he is dried out, and represents the King of Winter. 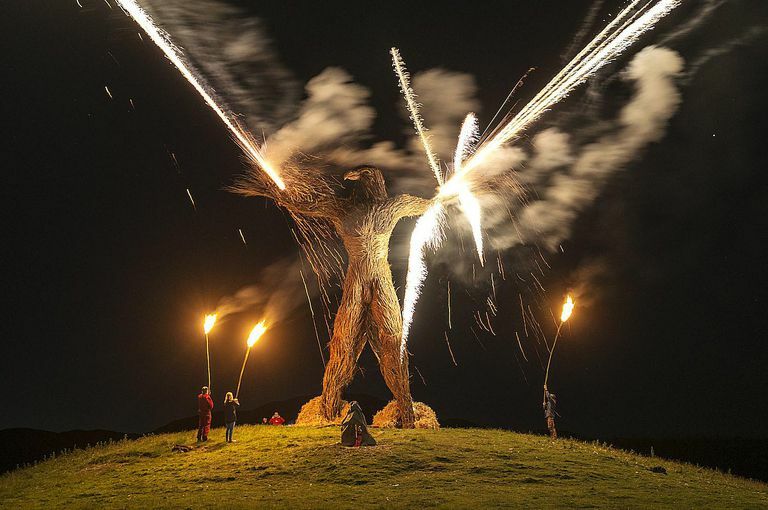 There's also an annual event held in Dundrennan, Dumfries & Galloway, Scotland, called the Wicker Man Festival. This, however, is not a Pagan event, but an alternative arts and music celebration that is more along the lines of Bonaroo or Burning Man, although it's much more family friendly. Each year, the festival culminates with the burning of a giant, three-story-tall Wicker Man.